An artists' impression of the museum. A planning application has now been submitted for a new extension, which will help breathe life into the expanded Northampton Museum and Art Gallery. 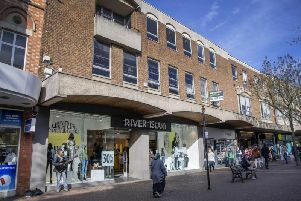 Northampton Borough Council is carrying out a major renovation, which will include a new extension housing the shoe gallery with a link space, café and roof terrace above. The renovation work includes provision of a new 380sqm gallery for temporary exhibitions, enabling the museum to host major touring exhibitions and develop in-house exhibitions focusing on the world-class designated shoe collection and the history and heritage of Northampton. Councillor Anna King, Borough Council Cabinet member for community engagement, said: “A huge amount of work has gone into designing this link space, which will be the new museum’s hub. “This is a major project, the kind that comes once in a generation, so we need to make sure it’s absolutely the best it can be. The extension will bring together the three main buildings which form the new museum space – the existing Museum and Art Gallery, the former Gaol Block in Angel Street and part of the former county council offices on Guildhall Road. The work will include provision of new schools and activity spaces, and a major space for events and corporate hire. The council is expecting to tender for the build contract in the new year.